TFI Envision Reaches the Summit | TFI Envision, Inc.
Portland, OR — Over the past 24-years, the Summit Award organization has established itself as an arbiter of creative excellence by providing validation of award-winning work. It functions as a respected, international, industry-wide critique. The organization conducts the Summit Creative Awards each year to honor the best web, design, video, advertising, packaging, interactive, mobile & social marketing from small and mid-size creative agencies worldwide. The 2018 creative competition drew more than 5,000 submissions from a record-breaking 26 countries. TFI Envision, Inc. was selected by an international panel of judges as a Finalist in the Marketing Materials – Package Design category for BioLab, Inc. SpaGuard® Product Line Packaging. 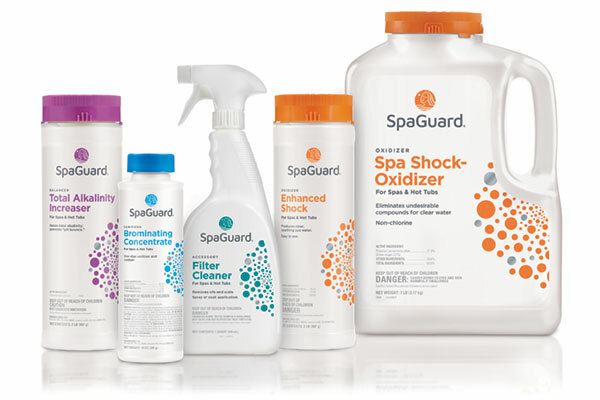 TFI Envision had been selected by Biolab, Inc., to update the logo and packaging for their SpaGuard® brand of professional quality spa care products, in an effort to appeal to more upscale consumers and improve their product perception in-store and online. TFI Envision approached the logo update as an evolutionary step to the familiar and trusted logo, bringing a more contemporary elegance to the brandmark with a new simplified illustration and simplified, impactful logotype. The new color coded ‘effervescent’ graphic treatment helps to differentiate each product category. Utilizing liquid silver ink as part of the ‘effervescent’ graphic treatment infused brightness and clean feeling. The new typography is positioned to separate specific copy elements, making it easy to read. TFI Envision also changed the bottles to a consistent, clean, bright, pearlized white plastic with a clear, matte label substrate that disappears onto the bottle, creating a seamless look.